Brand was born in Dongara, Western Australia, the eldest of four children of Albert John Brand, a farmer, and his wife Hilda, née Mitchell. His maternal grandfather was Samuel Mitchell, a Cornish immigrant who was a pioneer of the mining industry in Western Australia and served in both houses of state parliament. Brand's parents farmed at Northampton and moved to a farm near Mullewa in 1924. He left school at 14 to work on the farm, and at Mullewa became secretary of the local branch of the Primary Producers' Association, a forerunner of the Farmers Federation. Dongara is a town 351 kilometres (218 mi) north-northwest of Perth, Western Australia on the Brand Highway. The town is located at the mouth of the Irwin River. The area has been marketed as the 'Rock lobster capital of Australia'. 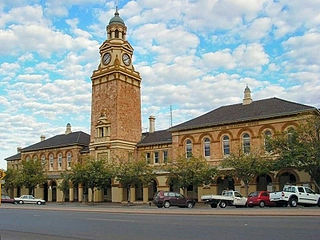 Northampton is a town 52 kilometres (32 mi) north of Geraldton, in the Mid West region of Western Australia. At the 2011 census, the town had a population of 868. The town contains a National Trust building. The town lies on the North West Coastal Highway. Originally called The Mines, Northampton was gazetted in 1864 and named after the colony's Governor, John Hampton. The town was sited in the Nokanena Brook valley, between the hamlets around the two major copper mines in the area, the Wanerenooka and the Gwalla. Albert Redvers George Hawke was the 18th Premier of Western Australia and the first one to be born in the 20th century. He served from 23 February 1953 to 2 April 1959, and represented the Labor Party. His nephew, Bob Hawke, became Prime Minister of Australia. John Trezise Tonkin AC, popularly known as "Honest John", was an Australian politician. A member of the Labor Party, he served as a Member of the Western Australian Legislative Assembly for a record 44 years from 1933 to 1977, and was the 20th Premier of Western Australia, serving from the 1971 election, where his party defeated the ruling Liberal–Country coalition led by David Brand, to the 1974 election, where the Labor Party was defeated by the Liberal–Country coalition led by Charles Court. A number of landmarks were later named or renamed after him, including the Tonkin Highway and John Tonkin College in Mandurah. The Second Australian Imperial Force was the name given to the volunteer personnel of the Australian Army in World War II. Under the Defence Act (1903), neither the part-time Militia nor the full-time Permanent Military Force (PMF) could serve outside Australia or its territories unless they volunteered to do so. The Second AIF fought against Nazi Germany, Italy, Vichy France and Japan. After the war, Australia's wartime military structures were demobilised and the 2nd AIF was disbanded, although a small cadre of its personnel became part of the Interim Army that was established in 1947, and from which the Australian Regular Army was formed in 1948. The Volunteer Defence Corps (VDC) was an Australian part-time volunteer military force of World War II modelled on the British Home Guard. The VDC was established in July 1940 by the Returned and Services League of Australia (RSL) and was initially composed of ex-servicemen who had served in World War I. The government took over control of the VDC in May 1941, and gave the organisation the role of training for guerrilla warfare, collecting local intelligence and providing static defence of each unit's home area. General Harry Chauvel, who had retired in 1930, was recalled to duty in 1940 and appointed Inspector-General of the VDC. Chauvel held this position until his death in March 1945. Mingenew is a town in Western Australia, located 383 kilometres (238 mi) north of the state capital, Perth. It is the seat of government for the Shire of Mingenew. The Division of Brand is an Australian electoral division in the state of Western Australia. The division was named after Sir David Brand, the longest-serving Premier of Western Australia. Sir Charles Walter Michael Court, was a Western Australian politician, and the 21st Premier of Western Australia from 1974 to 1982. He was a member of the Liberal Party. The Electoral district of Pilbara is a Legislative Assembly electorate in the state of Western Australia. Pilbara is named for the region of Western Australia in which it is located. It is one of the oldest electorates in Western Australia, with its first member having been elected to the Second Parliament of the Legislative Assembly at the 1894 elections. Frank Joseph Scott Wise AO was a Labor Party politician who was the 16th Premier of Western Australia. He took office on 31 July 1945 in the closing stages of the Second World War, following the resignation of his predecessor due to ill health. He lost the following election two years later to the Liberal Party after Labor had held office for fourteen years previously. Sir Duncan Ross McLarty, was an Australian politician and the 17th Premier of Western Australia. The Queensland Labor Party (QLP) was a political party of Queensland, Australia formed in 1957 by a breakaway group of the then ruling Labor Party Government after the expulsion of Premier Vince Gair. In 1962 the party became the Queensland section of the Democratic Labor Party (DLP). The party continued to hold seats in the Queensland state parliament until 1972, then suffered a collapse in its vote and wound itself up in 1978. Elections were held in the state of Western Australia on 30 March 1974 to elect all 51 members to the Legislative Assembly and 15 members to the 30-seat Legislative Council. The one-term Labor government, led by Premier John Tonkin, was defeated by the Liberal Party, led by Opposition Leader Charles Court. This is a list of members of the Western Australian Legislative Assembly between the 1947 election and the 1950 election, together known as the 19th Parliament. The Tonkin Ministry was the 25th Ministry of the Government of Western Australia, led by Labor Premier John Tonkin and deputy Herb Graham. It commenced on 3 March 1971, eleven days after the Brand–Nalder Ministry, led by Premier David Brand of the Liberal Party, was defeated at the 1971 election. The ministry was followed by the Court–McPharlin Ministry on 8 April 1974 after the Labor Party lost government at the state election held on 31 March. The Hawke Ministry was the 22nd Ministry of the Government of Western Australia, led by Labor Premier Albert Hawke and deputy John Tonkin. It commenced on 23 February 1953, nine days after the McLarty–Watts Ministry, led by Premier Ross McLarty of the Liberal Party, was defeated at the 1953 election. The ministry was followed by the Brand–Watts Ministry on 2 April 1959 after the Labor Party lost government at the state election held on 21 March. Elections were held in the state of Western Australia on 8 April 1933 to elect all 50 members to the Legislative Assembly. The one-term Nationalist-Country coalition government, led by Premier Sir James Mitchell, was defeated by the Labor Party, led by Opposition Leader Philip Collier. The history of the Australian Labor Party has its origins in the Labour parties founded in the 1890s in the Australian colonies prior to federation. Labor tradition ascribes the founding of Queensland Labour to a meeting of striking pastoral workers under a ghost gum tree in Barcaldine, Queensland in 1891. The Balmain, New South Wales branch of the party claims to be the oldest in Australia. Labour as a parliamentary party dates from 1891 in New South Wales and South Australia, 1893 in Queensland, and later in the other colonies. Gerald Percy Wild MBE AM was an Australian politician who served as a Liberal Party member of the Legislative Assembly of Western Australia from 1947 to 1965. He was a minister in the governments of Sir Ross McLarty and Sir David Brand, and later served as Agent-General for Western Australia from 1965 to 1971. Arthur William Bickerton was an Australian politician who was a Labor Party member of the Legislative Assembly of Western Australia from 1958 to 1974, representing the seat of Pilbara. He served as a minister in the government of John Tonkin. Victor Doney was an Australian politician who was a Country Party member of the Legislative Assembly of Western Australia from 1928 to 1956. He served as a minister in the government of Sir Ross McLarty. ↑ Samuel Mitchell – Biographical Register of Members of the Parliament of Western Australia. Retrieved 3 June 2016. ↑ David Brand – Australian Electoral Commission. Retrieved 6 December 2011.